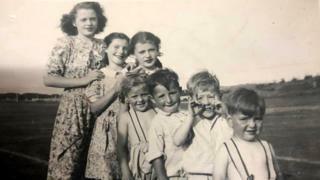 The discovery in Australia of old family photos taken in Aberdeen 70 years ago has sparked an international appeal for information. Supermarket manager Anna Christopoulos started her search after the find was made in a trolley at Woolworths in Woodcroft in Adelaide. They appear to be from the 1940s, 50s and 60s in Aberdeen and the north east of Scotland. No-one has claimed them. Mrs Christopoulos said: "I hope someone recognises these beautiful pictures." She said a colleague found the box of dozens of photos on 22 March. Mrs Christopoulos told the BBC Scotland news website: "He handed them to me in hoping that the rightful owner would come into the shop to claim them. "Then on the Monday, with still no claim, I decided to share these pictures online in anticipation that someone would recognise them. The post has gone viral." She explained: "A member of the public, Moira McLeod, recognised her sister Marjory Steel in a couple of the pictures and came down - about a 35-minute drive from a suburb called Blackwood - to take a closer look and confirmed that it was indeed her sister." However, her late sister was the only person she recognised. Mrs Christopoulos said: "We are still baffled as to why these pictures were left in a trolley and nobody has claimed them. "These photos are of sentimental value and priceless. "If someone had found my photographs of my family, I'd hope they'd do the same thing."